Abu Dhabi, United Arab Emirates: Ferrari World Abu Dhabi is living up to its promise to create a unique leisure experience in the region, with thousands of families and fans through the doors in the opening month. The soft opening period will culminate in the much anticipated Grand Opening ceremony, which will take place on Tuesday 30 November 2010. The park will be closed to the public on 30th November for the Grand Opening and will reopen on 1st December, in time for the National Day weekend celebrations. During its soft opening period, the Park also saw a number of high profile celebrity visitors pass beneath its iconic red roof. Kanye West, Prince Albert of Monaco, Jeremy Renner, the Jonas Brothers, Fernando Alonso and Felipe Massa were just a few of the first people to come and pay homage to the world’s first Ferrari theme park. The park features 20 rides and attractions designed to bring to life the Ferrari story as well as six food and beverage outlets presided over by four Michelin starred chefs. It is the world’s largest indoor theme park and the only attraction of its kind in the Middle East. 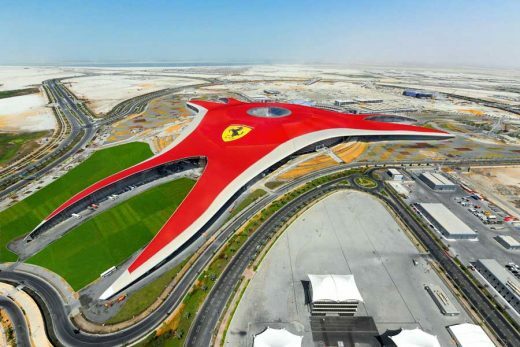 Ferrari World Abu Dhabi opens today. 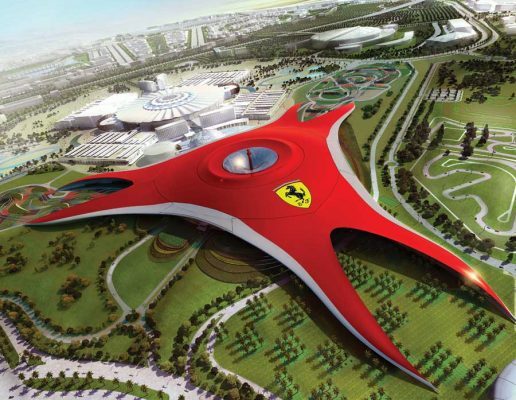 This stunning star-shaped building is the world’s first Ferrari inspired Theme Park – a thrilling brand experience like no other, a multi-sensory celebration of a design icon. Ferrari World Abu Dhabi is set to become the world’s largest indoor theme park. 10 Nov 2009 – Externally the Ferrari World Abu Dhabi building expresses the language and values of the Ferrari brand itself. Benoy’s vision – to create a building that reflects Ferrari’s sinuous form, is directly inspired by the classic double curve side profile of the Ferrari GT chassis. The double curve was proportionately applied in elevation to set the structure’s length and height. This proportion gave rise to the dynamic scale of the building at 700 metres from tip to tip of the tri-forms. Internally, a collection of over 20 high octane attractions provide excitement for the whole family. The focal attraction will be the 60 metre high ‘G-Force Tower’ – one of the most intense ‘freefall’ experiences in the world. Several roller coasters continue the adrenalin raising theme, including the world’s fastest, reaching speeds in excess of 200kph. The project is due for completion mid 2010. Benoy are currently delivering the scheme on behalf of Abu Dhabi’s key developer – Aldar Properties. 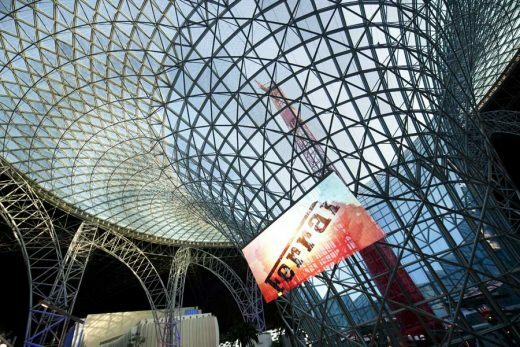 first Ferrari Theme Park, designed by Benoy – a thrilling brand experience like no other, a multi-sensory celebration of a design icon. 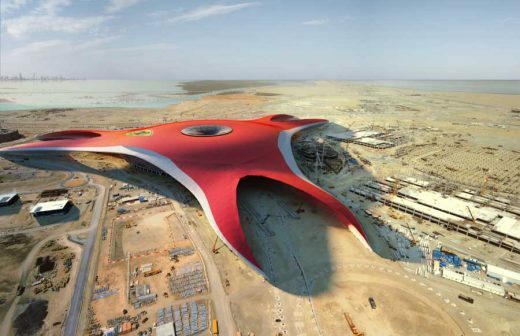 Opening in 2010, Ferrari World Abu Dhabi is set to become the world’s largest indoor theme park. 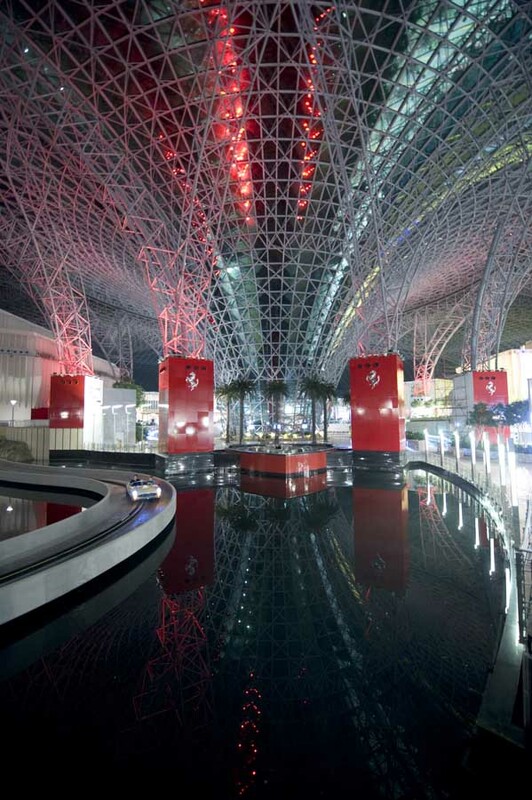 Externally the Ferrari World Abu Dhabi expresses the language, values and passion of the Ferrari brand itself. Benoy’s vision – to create a building that reflects Ferrari’s sinuous form, is directly inspired by the classic double curve side profile of the Ferrari GT chassis. The double curve was proportionately applied in elevation to set the structure’s length and height. This proportion gave rise to the dynamic scale of the building at 700metres from tip to tip of the tri-forms. The metal skin roof is highly insulated and the main façades utilise efficient glass to reduce thermal loads and glare. The spectacular roof forms a feature of the building providing a fifth elevation and serves as the backdrop to a huge Ferrari logo, that will welcome all passengers flying into Abu Dhabi International Airport. Internally, a collection of over 20 high octane attractions provide excitement for the whole family. The focal attraction will be the 60metre high ‘G-Force Tower’ – one of the most intense ‘freefall’ experiences in the world. Two roller coasters continue the adrenalin raising theme, including the world’s fastest, reaching speeds in excess of 200kph. Ferrari World Abu Dhabi’s location, scale and purpose combine to present enormous architectural challenges. 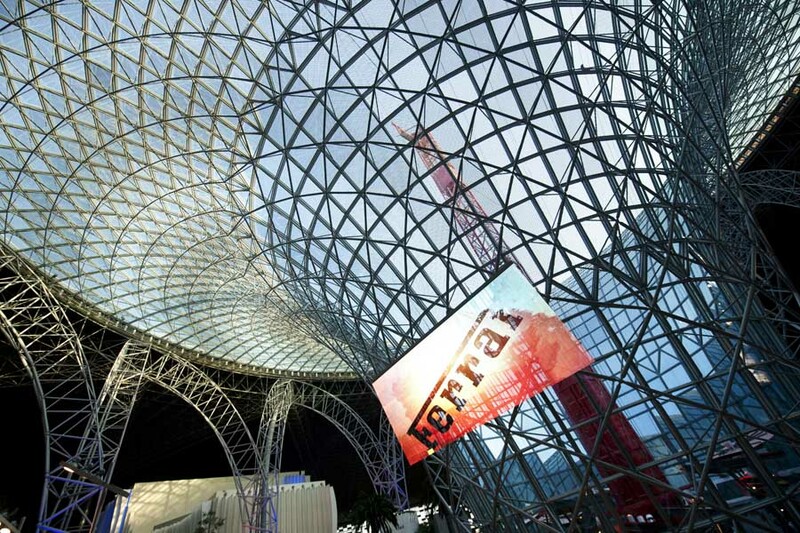 In response Benoy has delivered a revolutionary design solution. The end result is an iconic landmark leisure destination that reflects both the integrity of the Ferrari brand and the ambitions of Abu Dhabi, and is a project which Benoy is very proud to be associated with.